The remake of the 1973 made-for-TV horror film produced and co-written by Guillermo Del Toro will hit Blu-ray in January. 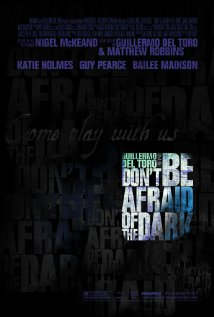 In an early announcement to retailers, Sony is working on 'Don't Be Afraid of the Dark' for Blu-ray release on January 3. Starring Bailee Madison, Guy Pearce, and Katie Holmes, the movie takes place in Rhode Island and is about a young girl sent to live with her father and his new girlfriend only to discover evil creatures dwelling inside the gothic home. The Blu-ray will feature 1080p video, a DTS-HD Master Audio 5.1 soundtrack, and supplements will include The Story, Blackwood's Mansion, and The Creatures featurettes. You can find the latest specs for 'Don't Be Afraid of the Dark' linked from our Blu-ray Release Schedule, where it's indexed under January 3.